I just got finished fertilizing about 170 roses in my garden. When I do something, I do it big! It's an extremely exciting time if you are a gardener in the northeast. Hour by hour, all the plants are popping. I'm doubly excited because the fertilizer I ordered arrived today at my front door, hours before the start of several days of a good, soaking rain. Perfect timing. Coming into the kitchen in the morning shows progress and beauty in the garden every day. When I remodeled my kitchen a few years back, one of my wishes was to have expansive views of the garden from the kitchen. We installed 20' of windows. I wanted as many windows as I could get for natural lighting in the kitchen and wonderful garden views. I WAS a bit concerned with not so great views over the winter, but I was willing to pay that very small price. Of course, there is beauty in many winter views as well, with or without snow. When you consider remodeling your kitchen, window size and placement should play an important role. It's funny, but even today, when windows are getting larger in many homes, there is often still hesitation to "go large" with the kitchen window. And, in many cases, and this is a key point, if the kitchen is in the back of the house, the house may have been purchased, partially, for the beauty of the yard, and the existing kitchen windows do not often allow one to fully appreciate the views! It is a paradox that is amusing to me. taking care not to worry that expanding a window relates to an "unacceptable" amount of lost cabinet storage. This part is tricky. Of course, in small kitchens, it is a more critical issue. In medium and large kitchens, carefully evaluate the pros and cons of a larger window before saying a quick "no...I'll lose too much storage." if the window or windows should be situated for a specific view of a pool, a play area, garden, wide vista, etc. what role will privacy play in your window location? What if your view is not park like, but looks toward a brick wall, a driveway or other nondescript area? Think beyond what you see outside at this moment. Is it possible to add some landscaping to enhance the existing view? Often, it is, but is something the homeowner did not consider. Is there a spot for a long window? 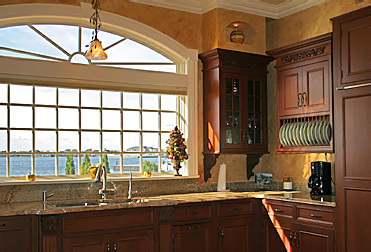 Long windows have a place in a kitchen as well. Short windows are not the only size that must be in a kitchen! I once spoke with a wheelchair bound homeowner and suggested a tall window just beyond the cabinetry, so that he could enjoy the view outdoors. This was a welcome suggestion! In a future post, I will discuss how to select the size and shape of the window. I'm now energized for the next 6 months of garden viewing out my kitchen window! (see below) And, no, we do not have a gardener! My husband and I designed the garden ourselves, dug every hole (2'x2'), prune every bush, hand water in between rains, do garden clean up multiple times a year, we do not have a "service", it is all our work, which we like to look at and enjoy. A "garden walk" with a glass of wine is a good reward too. Roses were purchased one by one over a several year period. Five more just arrived last week! What can I say? It's a obsession hobby. You'll find me in the garden most days now from 5-8 pm! UPDATE: While I was thinking roses, see a follow up to this post with good information by Peggy at kitchen-exchange.